Download "Official Documents for 2015 Marathon des Sables"
1 Official Documents for 2015 Marathon des Sables Please take care when completing these documents they may be rejected if incorrect. They must be printed in colour and completed by hand. They must be posted to: Running The Sahara Ltd PO Box 3953 MELKSHAM SN12 9AY NOTE - faxes or ed scans are NOT acceptable. Please print one per sheet (ie not on the reverse) and note that two of the forms will print out on one sheet, so they are both half-sized. 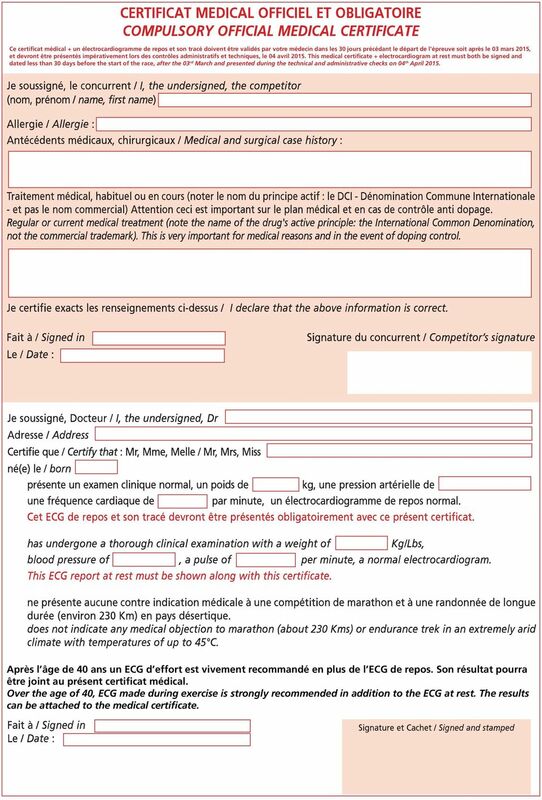 The Medical Certificate is NOT required at this time you will need to complete it (and an ECG) not more than 30 days prior to the race and take it with you to Morocco. Please note that in a change to previous years, blood group details are no longer requested. 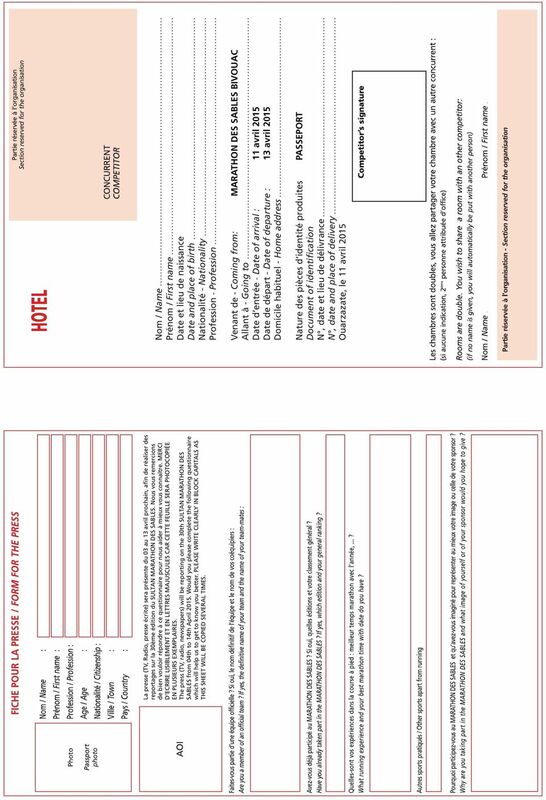 Please ensure that you have done the following: Signed and dated both the Registration form and the Personal Information form where it says Signed (in) you need to put the name of the town you are in when you sign it. Written Read and approved in the lower half of the Registration form. Completed as much of the form as possible. 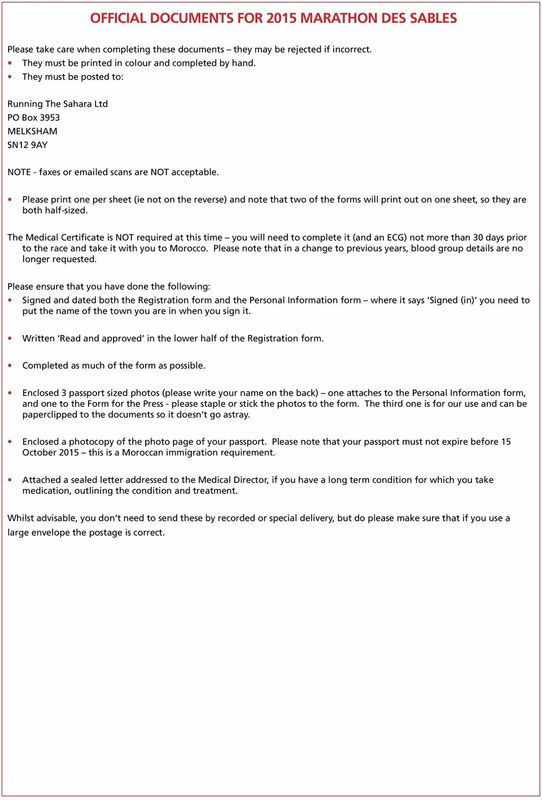 Enclosed 3 passport sized photos (please write your name on the back) one attaches to the Personal Information form, and one to the Form for the Press - please staple or stick the photos to the form. The third one is for our use and can be paperclipped to the documents so it doesn t go astray. Enclosed a photocopy of the photo page of your passport. 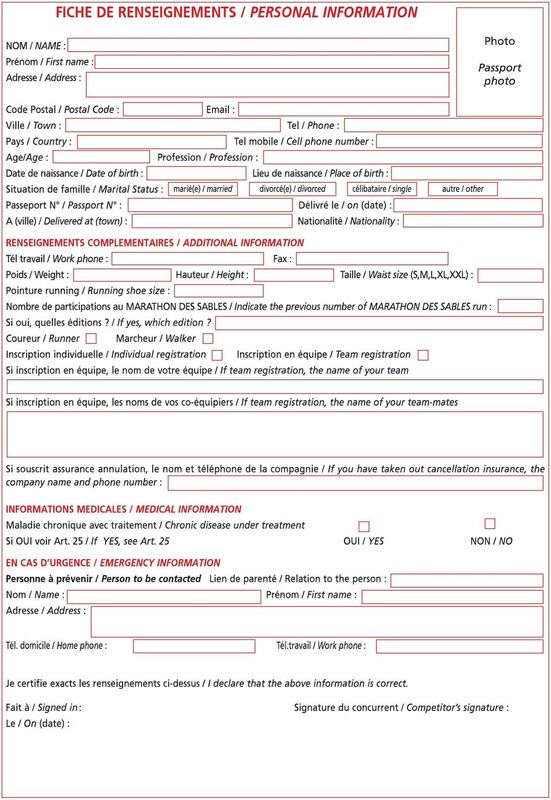 Please note that your passport must not expire before 15 October 2015 this is a Moroccan immigration requirement. Attached a sealed letter addressed to the Medical Director, if you have a long term condition for which you take medication, outlining the condition and treatment. Whilst advisable, you don t need to send these by recorded or special delivery, but do please make sure that if you use a large envelope the postage is correct. 4 Ce certificat médical + un électrocardiogramme de repos et son tracé doivent être validés par votre médecin dans les 30 jours précédant le départ de l épreuve soit après le 03 mars 2015, et devront être présentés impérativement lors des contrôles administratifs et techniques, le 04 avril This medical certificate + electrocardiogram at rest must both be signed and dated less than 30 days before the start of the race, after the 03 rd March and presented during the technical and administrative checks on 04 th April Après l âge de 40 ans un ECG d effort est vivement recommandé en plus de l ECG de repos. Son résultat pourra être joint au présent certificat médical. Over the age of 40, ECG made during exercise is strongly recommended in addition to the ECG at rest. The results can be attached to the medical certificate.